With its vibrant colour range and sparkling silver trim the Electra Ballpen is is perfect for promotions where you want to convey an image of classical style with contemporary finishing. Its high-grade aluminium construction is protected by a richly-tinted anodised finish for that chic modern look. Our uniquely-designed construction ensures that it complies with the latest safety regulations for your peace of mind. It also comes with a high-capacity black refill containing documental quality ink and is available on an optional express print service. 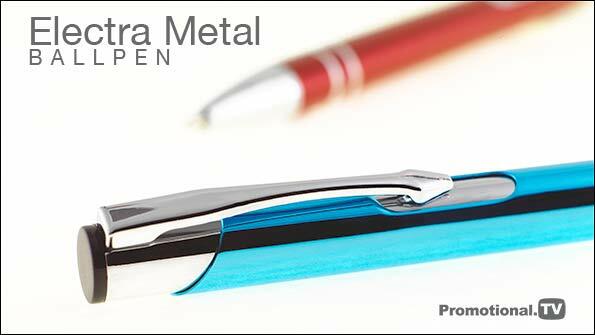 The Electra Ballpen operates on a push-button mechanism; has a large print area on the barrel and can be printed in up to 6 colours to accurately match your corporate identity. Laser engraving is also available for that extra touch of luxury. It can be supplied in a display tube at minimal additional cost to you and there are many alternative packaging options to choose from in our extended range.